We’re going to be talking about birds again. For the not-so-ornithologically inclined, I apologize. However, I suggest you keep reading, you may learn something! 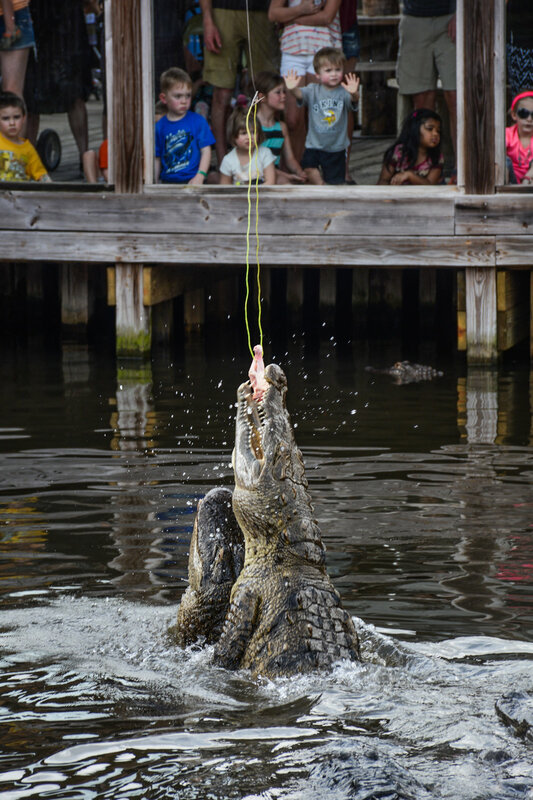 There will also be some awesome pictures of alligators, so perhaps that will keep your attention. Okay, back to the story of today. Today’s journey was to Gatorland. Now, as I’ve written about before in these journals, like when M and I visited the Toronto Zoo, I have mixed opinions about any establishment that keeps animals in captivity. For me, there’s always going to be something sad about seeing a wild animal locked in a box. However, in some cases it can be a matter of necessity, as some animals who become injured and are sent to a rescue for recovery, may not be able to survive in the wild anymore, making captivity their only option. Or death of course. However, I’m also encouraged by the conservation efforts that many of these organizations put into the animals in their care. Some groups even take it beyond that scope and look to improve the conditions for the animals that are not in their care, but simply looking to improve conservation efforts as a whole. I can’t speak for the Gatorland organization as a whole, as there’s very little information available online to tell me how much of their ticket sales goes back into protecting the animals and other conservation efforts, but I did see some pretty encouraging signs while at the park. The first thing you see when you pull into the parking lot is the massive gator mouth that rises from the concrete. It’s a pretty interesting site, made even more so by the fact that it’s been standing there since around the time the park opened in 1949 and even survived a three-alarm fire that destroyed most of the main building of the park back in 2006 (sadly, a crocodile and two pythons died in that fire). It also looked pretty much the same as I remember when my parents took my brothers and I there as kids. 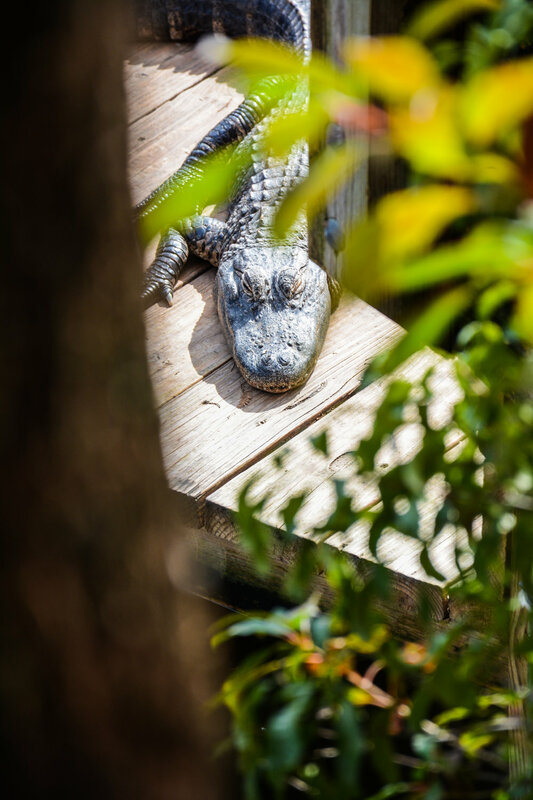 And while the park isn’t the biggest of theme parks, compared to Universal Studios and Disney World which are obviously Florida’s main attractions, for tourists looking to see alligators, Gatorland is the place to go. Stepping through the gates you’re greeted with a series of boardwalks that stretch over a lake. In the lake, are a number of wooden platforms, and many, many gators. We walked through the park, many of us pointing out the largest gators we could find. 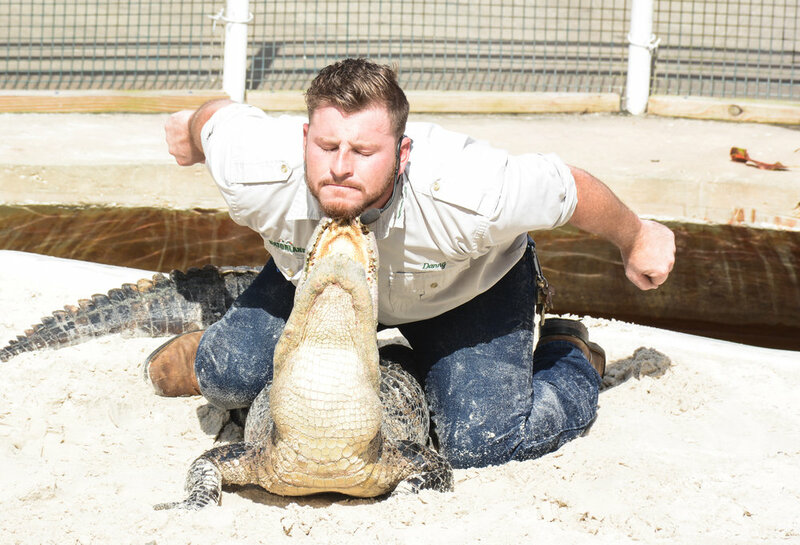 We stopped for a Gator Wrestlin show. We toured the marsh, and watched the Gator Jumparoo, which is exactly what it sounds like. This is probably the most memorable thing I recall from visiting the park as a kid. 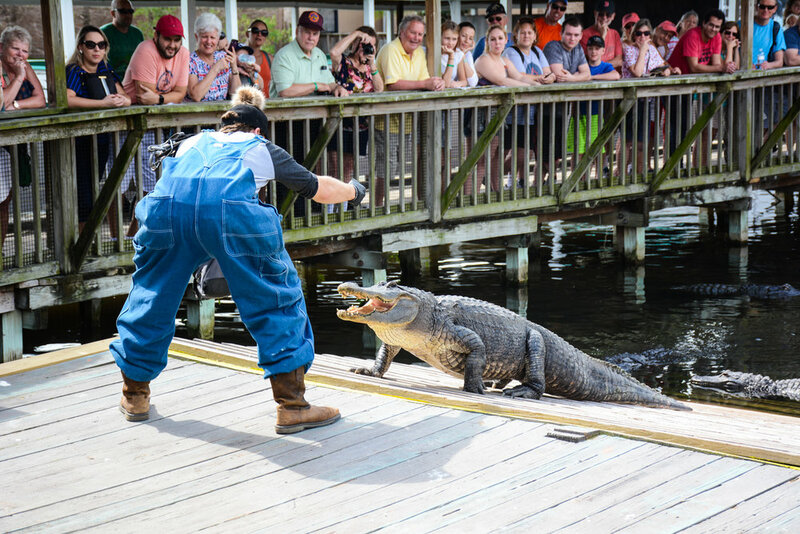 I guess there’s something about the clapping sound an alligator’s jaw makes as it jumps out of the water to nab a raw chicken that just sticks with you. Once again though, it was the birds that I was most excited about. 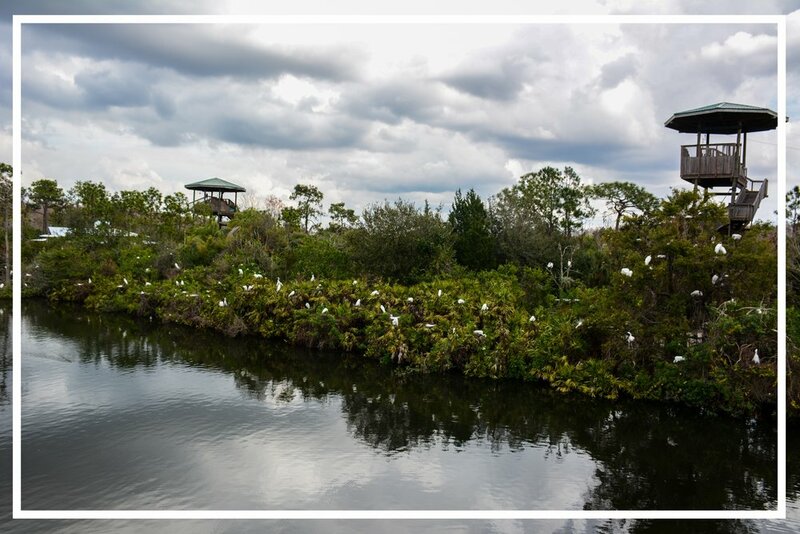 In 1990, the park constructed an alligator breeding marsh and bird rookery (a place for birds to nest). I don’t remember it being too populated when I came many years ago, but that has certainly changed now. A wide canal is heavily populated with large gators and lined with thick green foliage. 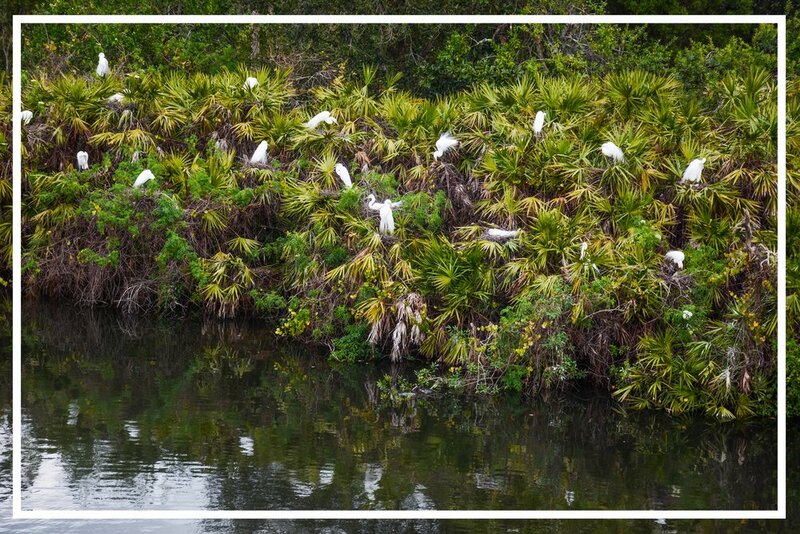 These bushes are dotted with large Egrets guarding their nests. Cormorant nests dot the tops of the trees overhead, and many Wood Storks roost in the trees around us. There are several board walks and lookout towers that offer amazing views of the entire thing, and for the second day in a row, my camera is clicking away. According to Gatorland’s information, the area is the largest and “most accessible” wading bird rookery in Central Florida. Since the 10-acre man-made marsh opened in 1990, the bird population has grown from four to over 2,000 breeding pairs, most of them federally protected birds, some even threatened or endangered. The marsh also helps to keep other predators away. Apparently the presence of so many massive gators has that effect. Surprise, surprise. I’ve sine learned that the marsh is also part of the Great Florida Birding Trail, a program developed by the Florida Fish and Wildlife Conservation Commissions. Honestly, it was completely stunning to see so many large birds in one place, especially with so many of them facing threats from development destroying the habitat they rely on. As I walk along the boardwalk, I think about my own impact on this process. A big portion of the development in Florida is driven by the massive tourism industry. In fact, just outside our Orange Lake resort, a 300-acre, $750 million Margaritaville resort is being constructed. It’s ridiculous in scope, and more troubling when a bit of general research reveals that a portion of the land being used could actually be paving over areas listed as Strategic Habitat Conservation Areas by the Florida Department of Environmental Protection, or fairly nearby to them. While finishing up our final viewings at the park, we said goodbye to Kyle and Kelly who were heading off for a few days together in another part of Florida. After heading home from the park, it was a quiet night back at the condo, many of us tired out from a day walking in the sun.